Alt P/N. : 14004-00530000 14004-00750000 ..
ASUS U57 U57A U57DE U57DR U57N U57VD U57VJ U57VM .. 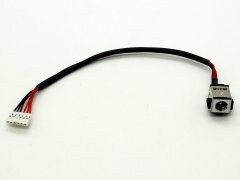 Note: Laptop manufacturers may use a different Power Charging Socket DC IN Cable for ASUS U57 U57A U57DE U57DR U57N U57VD U57VJ U57VM Series. Please enlarge the picture in this page and compare with the original item in your laptop. The customer is responsible for ordering the correct laptop parts.